Many saw last week’s deposition of Ukrainian President Yanukovich as a triumphant display of positive change stemming from a revolution of the masses. Obviously, this has been a topic of discussion on the Global Atlas for several weeks – even months – as Ukraine strayed from their Western ambitions to foster closer ties with the E.U. and leaned even farther into Russia’s nefarious embrace. 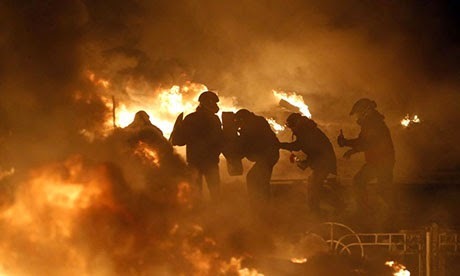 As a brief recap, mass protests ensued, eventually dwarfing the previously colossal Orange Revolution protests of 2004, and the situation deteriorated into widespread violence in Kiev and the eventual ouster of President Yanukovich. To many, including myself, last week’s events seemed a harbinger for imminent peace in Ukraine and, hopefully, the integration into the E.U. that Ukraine’s economy so desperately needs. 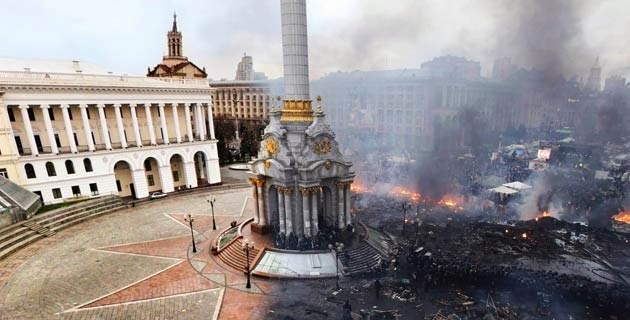 The Maidan or Independence Square in Kiev, before and after protests. Courtesy Feeldesain. Unfortunately, the story doesn’t end there – in fact, last week may simply have been the eye of the storm. Former President Yanukovich turned up in Russia yesterday, which should not be a surprise to anyone. His allegiance to the former Soviet empire was hardly masked during his wheeling and dealing with Russia over the past several weeks, and after being overthrown by his people, he has sought refuge in Moscow. With the Sochi Olympics being over, Russian President Putin likely has less deference for Western opinions on the matter, and will have no qualms about openly protecting a man who is being sought after by the transitional government in Ukraine for his role in the deaths of over 100 protestors. Foreign policy priorities and powerful interests oftentimes play out in the media (1). Broadly speaking, from the selection of news stories to the particular angles they may take, the U.S. media’s account of foreign events can give readers an interesting glimpse into the interests of America’s powerful. It is no coincidence that media attention focuses much more on matters that relate directly to U.S. national and corporate interests even though similar events around the world go underreported. Four case studies—the protests in Ukraine, Venezuela, the West Bank, and Thailand—help demonstrate this relationship. By a wide margin, the mass anti- and pro-government protests and accompanying political crisis in Ukraine have received a majority of the news coverage. Dozens have been killed and pictures of fires and violence from the protests have gone viral. While many may know of Ukraine only for its Chernobyl nuclear disaster, the former Soviet satellite has vast geostrategic importance to the United States. The U.S. has given over $3 billion to Ukraine since its independence in 1991, mostly for pro-market reforms and strengthening civil and political institutions. The billions of dollars in aid are intended to help orient Ukraine away from Russian influence through economic and political alignment with the West. Since 1995, Ukraine has also been in consultation with NATO to explore the possibility of membership. These developments have in part helped shape the current media portrayal of anti-government demonstrations there as a kind of post-Cold War tug-a-war between Western and Russian influences, since the now-disposed prime minister made an eleventh-hour rejection of talks with the European Union over Ukraine’s possible membership, a decision that became the very spark of current unrest. Indeed there are decades of economic, political and military interests at play between the West, Ukraine and Russia, and the media’s reporting has certainly reflected this. Venezuelan protests, too, have found their way onto the media’s main stage—or at least its orchestra section. Mass demonstrations erupted two weeks ago with grievances including rampant crime, high inflation, food shortages and general economic stagnation over the past 15 years. The country’s oil wealth and proximity to the United States add to the media’s interest in Venezuelan protests, however the two countries have a bitter history. Under Hugo Chavez’s presidency, the Venezuelan leader was not shy about his disdain for the United States and particularly its leaders. He and current President Nicolas Maduro have both blamed the U.S. for demonstrations against their leaderships, most recently when President Maduro accused the C.I.A. of attempting a coup. The story is only now beginning to reach a mass audience. steady flow of demonstrators since protests first gripped Thailand back in November 2013. As I’ve written before, the mostly-peaceful protests have occasionally turned violent by unknown assailants. 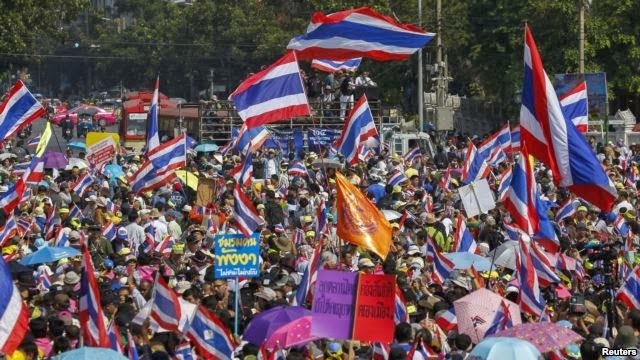 Just this past weekend, a bomb killed four people—three of them children—during an anti-government protest in Bangkok. On Sunday, 34 people were wounded and one girl killed by gunmen who open fired on demonstrators. Political leaders on all sides have signaled to their constituents to eliminate violence while those in power see their legitimacy evaporating in the eyes of thousands of demonstrators. Despite the fact that Thailand is party to the Southeast Asian Treaty Organization (SEATO)—a security pact signed by Thailand, the United States and six other nations—bilateral relations with the U.S. are generally poor. One of the biggest points of contention are the food subsidies given to American farmers by the federal government, which are seen as giving growers an unfair price advantage, especially in the rice market. While not a perfect comparison, Thailand's current political crisis is not too different from Ukraine’s, the only crucial difference being Ukraine’s higher geostrategic value to the West. While Israeli-Palestinians peace talks are at the heart of the Obama Administration’s Middle East policy, scant media coverage has been attributed to a demonstration of a different flavor that embodies one obstacle to peace: “thousands” (2) of Israeli youth joined protesters gathered in the West Bank city of Ma’ale to protest the freeze on construction of new settlements in the contested E-1 region. On the surface, the gathering was a one-day affair. Scores assembled in the city to show solidarity with and support for Jewish settlements in the West Bank during peace talks that would—if ever ‘successfully’ concluded—probably require the transfer of some settler lands to Palestinian ownership. What makes the gathering significant is the fact that members of Israeli Prime Minister Netanyahu’s own Cabinet attended the rally and that the international community roundly condemns Israel’s settlement expansion and points to it as the number one impediment to peace. The crowd’s zeal to promote the settler movement coupled with high-profile government supporters in attendance throws doubt on how acceptable a peace deal would be to the Israeli public and political spheres. Highlighting these bits in the U.S. media wouldn’t be good for the dimming hope surrounding the talks. (1) Edward Herman, and Noam Chomsky, Manufactured Consent: The Political Economy of the Mass Media, (New York: Pantheon Books, 1988). (2) Israel’s Haaretz news publication. Note that the youth gathering in the West Bank was almost entirely ignored by the American media. Mothers forced to abort unborn children; even forced to murder their own infants. Children sent away to prison camps for decades for crimes committed by their grandparents. Food as a weapon of control not only among prisoners, but also among the entire population. It sounds like the setup of a dystopian movie hellscape where modern rule of law has ceased to function. Instead, these are just some of the everyday realities faced by the people of North Korea. While North Korea’s horrific human rights record can hardly come as a surprise to observers, a UN report released Monday presenting evidence of abuses adds concrete facts to vague suspicions. 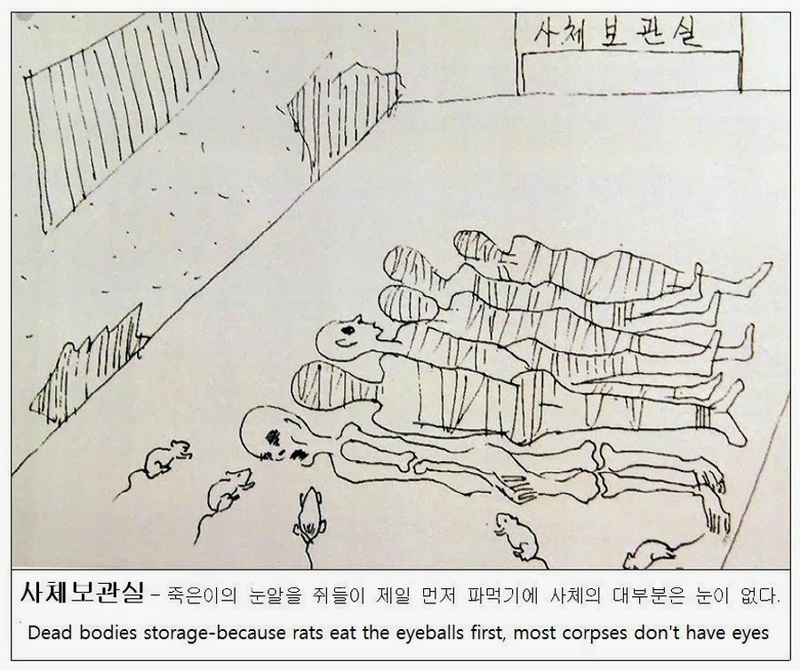 By collecting the testimonies of hundreds of North Korean defectors and refugees, the UN presents a case of crimes against humanity that is – by its own estimation – on the level of the Holocaust. Testimonies came from former regime loyalists as well as former prisoners, and reveal a somber picture of the inestimable damage done to the North Korean people in the last six decades. Central African Republic: Africa's Next Rwanda? The growing divide between Christians and Muslims in the Central African Republic is nothing new, despite not having received the coverage it deserves over the past several months. However, the violence has swelled in recent weeks, and the world is starting to take notice as a full-blow religious war is on the verge of erupting. The Central African Republic has arguably never had it easy – it was a French colony up until the end of the Cold War and remains one of the poorest nations in the world with a GDP per capita of just $900 – but a large conflict between the nation’s Christian population and its Muslim counterpart could have long-term, devastating effects. 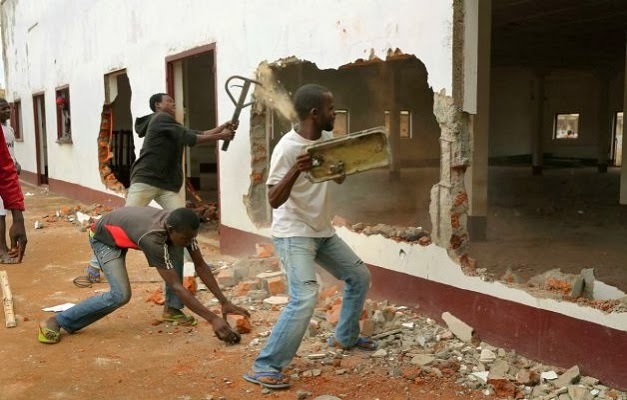 Christians destroy a building in CAR. Courtesy AP. The rapidly evolving conflict began sometime last year, when a Muslim rebel group seized power of much of the country and began calculated killings of Christians. The Seleka rebel group was in some cases accused of destroying entire villages – something not dissimilar to the acts of the M23 rebel group in neighboring Congo. The leaders of the Seleka group have since stepped down, creating a vacuum for the group which has given rise to Christian militia bands that have begun a mass “ethnic cleansing” of Muslims in retribution. The dominant reporting in Egypt goes something like this: Mohamed Morsi, Egypt's first democratically-elected President, and his Muslim Brotherhood are a threat to Egyptian national security. His removal from power by the military, while not unlike a coup, was legitimated by massive anti-government protests and widespread disapproval of Morsi's leadership, both of which threaten Egypt's social fabric. The Egyptian army, backed by popular support, stepped in to secure order and will act as midwife to the ugly, winding road to democracy. Democracy, democracy, democracy! While it's tempting to take any of these statements at face value, we're talking about a process with many competing interests and variables. Political plurality, free and fair elections, institutions and the rule of law all play a role in the democratic process. But in a country like Egypt with a dark history of martial--not rule of--law, government co-option of political parties, and a strangled press, these pillars of governance increasingly rely on independent assessment to test their efficacy. This role is traditionally shared by rights groups, professional syndicates and especially the media who act as watchdogs to and stakeholders in the political process. During this time of political transition and constitutional referendum in Egypt, neutral analysis of government action is central to the country's democratic potential. However, the current treatment of reporters, and harassment of domestic and foreign media outlets in Egypt (along with exclusion from the political arena and state-run media) throws doubt on the legitimacy of its democratic process. Just under a year ago, when the number of Syrian refugees had just topped a million people, the conflict had already caused the largest refugee diaspora and humanitarian disaster of the decade. Over the last year, the crisis has grown exponentially, and there are now more than 2.3 million registered refugees according to the UNHCR. 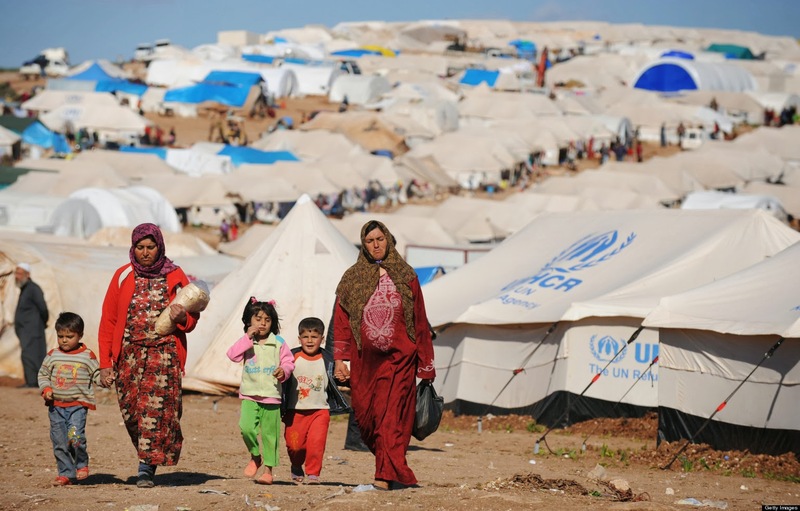 There could be as many as three million when unregistered refugees are taken into account. In 2013, more than 1.7 million refugees were registered by the UNHCR, 3.4 times the amount that registered the year before. The UNHCR has thus requested $4.2 billion in additional funding to assist it and more than 100 other agencies as they deliver life-saving aid to refugees both in camps and out, as well as to their host communities. Refugee camp in Iraqi Kurdistan. Courtesy PressTV.